In the last post we looked at Aristotle’s concept of happiness. In this post, let us consider some questions about happiness that you may have already wondered about. 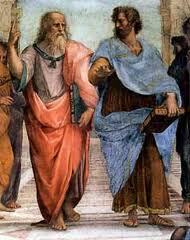 Plato on the right and Aristotle on the right. 1. One may for example ask ; which goods are more important to acquire out of the real unlimited goods if we want to cultivate happiness, but can’t devote equal time cultivating them ; Aristotle would say it is better to have strength of character than to have a richly cultivated mind. It is impossible to have a flourishing life and be happy without good habits (moral virtue). One can have highly cultivated intellectual virtue ( a brilliant mind ) but without moral virtue still fail to lead a happy , flourishing , good life. Of course one need some knowledge to live. 2. Can moral virtue be taught ? Socrates didn’t think so; he thought because of our choice of free will no one can succeed in making anyone morally virtuous , they have to be voluntarily disposed to learn and profit from being taught. ; and thus cultivate good habits and strength of character. Ones moral character gets formed in youth; it can be changed later but it takes a huge effort. Unfortunately the youth often do not have the maturity to think about the whole life and think about what would be best in the long run. Youth is more likely to be dictated by their immediate likes and dislikes. They don’t have the benefit of prudence,which involves taking counsel, deliberating about the options,weighing pros and cons, and being neither rash or indecisive.Why some end up with good moral virtues and other don’t, even if they grow up in the same household, no one knows. 3. Can one be perfectly virtuous or completely happy ? Although one should aim at the ideal but it is seldom attained because from time to time we don’t act in accordance with moral virtues;because the appetites over rule us. This would lead to incomplete happiness; of course more virtuous the person is, the more power one has to make a good like for themselves. Other reasons for incomplete happiness is from misfortunes. We may have to make a tragic choice due to circumstances beyond our control; for example having to choose between two bad or even evil choices; like choosing between one love and another, between love and duty, between conflicting loyalty etc. The quest for happiness is ongoing process, good luck on your journey. May you be happy and have good fortune.